CLICK HERE TO SHARE YOUR EXPERIENCES WITH “DANIELSON” WITH THE MOVEMENT OF RANK AND FILE EDUCATORS. Charlotte Danielson’s Framework for Teaching has been pushed by education reformers around the country, not to mention Danielson herself. Teachers in New York City are familiar with the FFT, or “Danielson” for short. The term “Danielson” has come to take on an ominous meaning over the past year. Many teachers have a sense that this framework is a bludgeon and not a tool to assess our effectiveness as teachers. Charlotte Danielson is an educational consultant based in Princeton, New Jersey. She has taught at all levels, from kindergarten through college, and has worked as an administrator, a curriculum director, and a staff developer. In her consulting work, Ms. Danielson has specialized in aspects of teacher quality and evaluation, curriculum planning, performance assessment, and professional development. Ms. Danielson has worked as a teacher and administrator in school districts in several regions of the United States. In addition, she has served as a consultant to hundreds of districts, universities, intermediate agencies, and state departments of education in virtually every state and in many other countries. This work has ranged from the training of practitioners in aspects of instruction and assessment, the design of instruments and procedures for teacher evaluation, to keynote presentations at major conferences. Clients for the development of materials and training programs include ASCD, the College Board, Educational Testing Service, the California Commission on Teacher Credentialing, and the National Board for Professional Teaching Standards. Charlotte Danielson has a rich and varied educational background. She holds a BA in history from Cornell University, and advanced degrees (in philosophy, economics, and educational administration) from Oxford and Rutgers Universities. She is based in Princeton, New Jersey, and has taught at all levels, from kindergarten through college, as well as working as an administrator, a curriculum director, and a staff developer. In her consulting work, Ms. Danielson has specialized in aspects of teacher quality and evaluation, curriculum planning, performance assessment, and professional development. It seems as if she is a jack-of-all-trades and master of none. She has “taught at all levels, from kindergarten to college” in “school districts all around the country.” She has been a staff developer, administrator and has received several degrees from prestigious institutions. Where does she find the time? How long did she actually stay in a classroom? It could not have been more than a few months here and a few months there, if that. Anything more and she would have had a coronary many years ago. Danielson may be a very bright person but she is no teacher. So why is her “framework” being used by principals across New York City to evaluate teachers? Here is an outline of what her framework looks like. Neat little categories? Check. Nifty little rubrics? Check. Thick educational buzzwords like “reflecting” and “pedagogy”? Check. It’s almost as if a monkey could rate a teacher using Danielson. Ah, that’s it! Monkeys are using the framework. The monkeys in question are the Bloomberg-era administrators who have spent no more than three years in an actual classroom. A framework crafted by a non-educator to be used by non-educators in order to judge actual educators. This makes perfect sense in the crazyland that is the NYC DOE. This is part and parcel of the deskilling of education. Not only are teachers in danger of being deskilled by being subject to Danielson but principals now are being deskilled by mindlessly ticking off a checklist. It seems as if many administrators are embracing this deskilling. And never forget who helped to bring Danielson into our schools. It was our union and their Unity leadership who allowed Danielson to be used in 33 “struggling schools”. When administrators in other schools started using it, the union cried and complained. Why did they complain? When you open the window you shouldn’t be annoyed when flies get in. 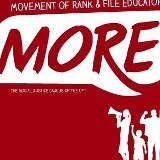 The Movement of Rank and File Educators want to hear from you, the rank-and-file educators of New York City. What are your experiences with Danielson? How are administrators in your building using and/or misusing this framework to evaluate you? b) Danielson – Deskilling the practice of educating for both teachers and administrators. Looks like the flies are getting in and leaving larvae in our brains. This is just another reason why Mulgrew needs to do nothing during this evaluation debacle. This entry was posted in An Embattled Career, education reform, School, teaching and tagged Charlotte Danielson, Danielson Framework for Teaching, Danielson Rubric, Movement of Rank and File Educators, Movement of Rank and File Educators (MORE), NY State Teacher Evaluations, Unity Caucus. Bookmark the permalink. Obviously, all we have to know is that she is smarter and better than us peons teaching in NYC. We must all conform to the Danielson way or be eaten alive. I’m not from NY, but AZ. Our district starting using it this year. All of a sudden veteran teachers are in “remediation” status. We have succumb to being “scripted” by our principals weekly- they sit with their little ipads and write everything they see and write down everything we say. It’s a business model, not a classroom model. Just awful. Good luck in NYC! God bless you and I’m sorry. I used to teach in Arizona myself. Yikes! How have you fared so far under this system? Are you being forced to follow this script everyday or just on observation days? Our union here calls it “sound education practice”. Most of us here call B.S. Unfortunately my school is also piloting the Charlotte Danielson Framework. So far, the majority of the staff has been rated ineffective. The irony here is that all we received was the actual rubric and told to learn it. No professional development or anything of the sort. I was rated ineffective solely on the fact that I did take notes while my students were testing and because I should’ve taken the exam from a child who was not answering any questions. The so called framework that is supposed to better us as teachers, is in reality, a tool for administrators to screw us.